Most of the time, plants are the ones that get eaten, but every now and then, a plant gets revenge. 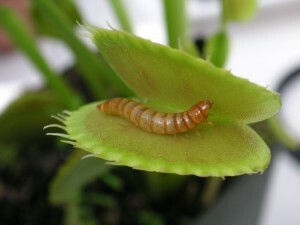 Some plants are carnivores. This means that they eat meat! Now, they certainly don’t eat steak, but they’re happy to feast on the occasional bug that crosses their path. Venus fly traps are probably the most famous carnivorous plants. These plants have a pair of thick, padded leaves that are covered with tiny hairs. When a fly touches the hairs – SNAP – the leaves shut like two powerful jaws. The plant releases enzymes that break down the fly’s insides into a soup. Dinner is served. Venus fly traps are carnivorous plants that have a pair of thick, padded leaves. When a fly touches the hairs – SNAP – the leaves shut like two powerful jaws. Pitcher plants are shaped like a pitcher or narrow champagne glass. The top and inside of the pitcher is covered with a slippery, but sweet-smelling nectar. When insects come to take a sip, they slip and fall into the pitcher. There, the plant breaks them down. Some pitcher plants are so large, they can catch and consume rats or frogs. Most carnivorous plants live in boggy areas. They live in poor, wet soil that doesn’t have a lot of nutrients. Carnivorous plants seem exotic, but more grow in the U.S. than anywhere else. North Carolina is the only place on earth where Venus flytraps grow natively. People are curious about carnivorous plants. Some try to take them from the wild. 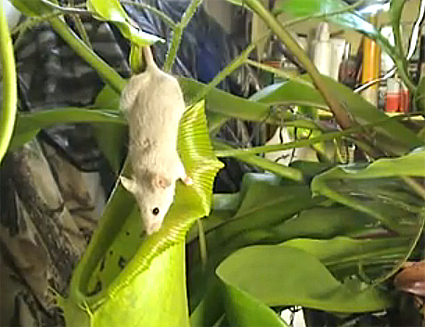 A video clip of carnivorous plants eating a mouse and a frog. Question: Are carnivorous plants mean? Answer: These plants have adapted to their environment over thousands of years. Because the soil doesn’t give them the nutrients they need, they’ve adapted by eating bugs. Clever, but not mean. Take the FREE & fun all about Carnivorous Plants quiz and download FREE Carnivorous Plants worksheet for kids. For lengthy info click here. Declan, Tobin. " Fun Carnivorous Plant Facts for Kids ." Easy Science for Kids, Apr 2019. Web. 26 Apr 2019. < https://easyscienceforkids.com/carnivorous-plants/ >.